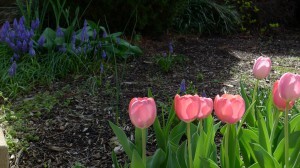 The tulips and grape hyacinth are blooming nicely, but unfortunately so are the weeds! Due to the unseasonably warm weather we’ve been experiencing here in St. Louis, everything has started growing 2 to 4 weeks ahead of schedule. I was hoping not to have to start the yard work so soon but if I don’t conquer the weeds, they will conquer my yard! Oh well… at least the spring flowers are beautiful and I’ve been able to bike ride ahead of schedule too!! Thanks Susan! 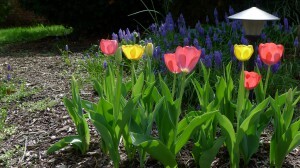 I planted the tulips last fall so this is the first year they have bloomed. The lilac bushes in my backyard are in bloom and smell amazing! !